Despite problems with the premises meaning the pub was some way from opening, we set off on a taproom trail around South East London on a Saturday in December with some clear objectives: meet some possible suppliers, have some great beer and enjoy a belting day out. I set off from Brockley Brewery on foot, a 45 minute trek that takes you past the magnificent Hop, Burns & Black bottle shop. Would have been rude not to I guess. When Jen announced I had enough 'beer miles' to cover my can of Cloudwater Pale I knew it was going to be some day. However my plans of taking the scenic route were scuppered, as was the case at the Butcher's Arms a few weeks earlier, by more keeping of unorthodox hours—why on earth had Nunhead cemetery closed so early? Undeterred I ploughed on and joined Bez at Brockley Brewery in time to settle down with a pint of Winter Gold. We're big fans of Brockley—regularly on tap in my local the East Dulwich Tavern—who offer a great range of beers, distinctively marketed with different colours for different beer styles, and a welcome focus on cask. What's more, Leah at Brockley has been hugely helpful in offering advice on our cellar setup. We very much look forward to doing business with them. A quick stop for an overpriced cheese sandwich and a seven minute train journey later, we were in Sydenham where the heavens were opening. 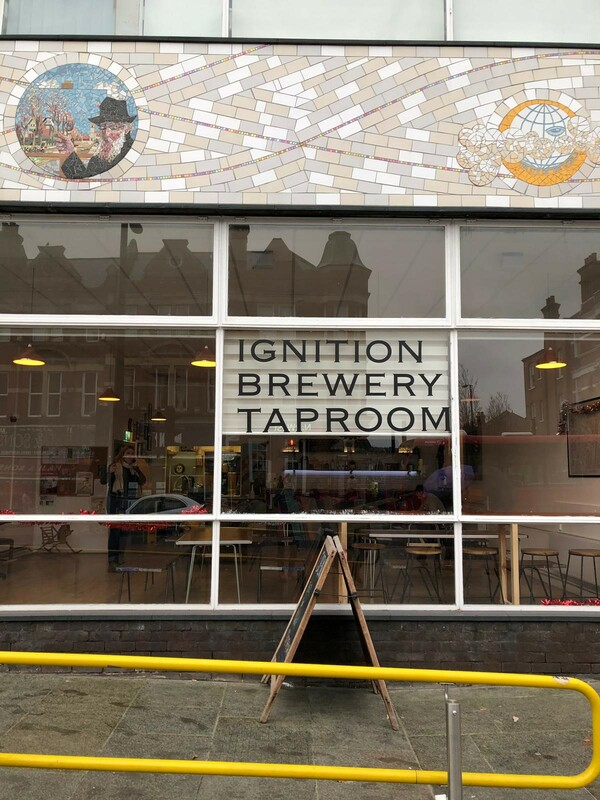 Thankfully it wasn't too far to Ignition, a brewery which employs and trains people with learning disabilities and focuses on keg and bottled beers. Nick, the owner, was incredibly friendly and we'll be in touch (hopefully) soon. Stockers joined in time for the narrow window we had in which to FaceTime a surprisingly formally dressed Stu, for our misguided attempt to complete the application for the BBC2 quiz show 'Only Connect' (perhaps the nerdiest programme on TV). 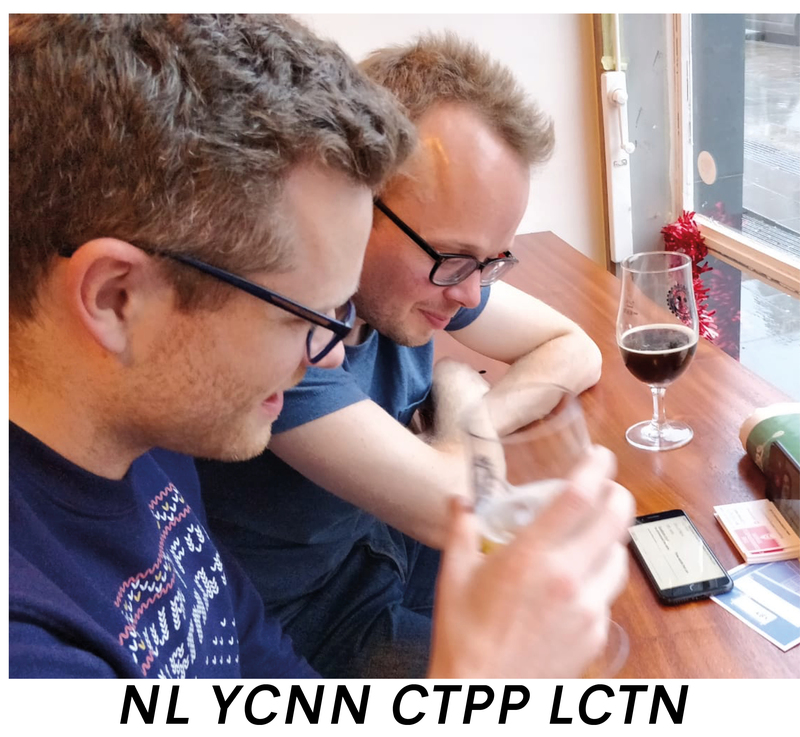 Armed with two phones, some business cards and a copy of the Financial Times, we concocted a setup that wouldn't prevent us from supping out pints of South of the River (pale ale) and Well Oiled Machine (porter). We look forward to receiving our annual rejection letter soon (update: the 'Micropublicans' duly received their rejection notice on 7 Jan). We pushed on to Penge where we eschewed the spectacularly named Pengemas in order to visit Southey's taproom. With Dave making the short walk from his house, we were now up to full complement. Over pints of Best, we learnt that after a particularly heavy Friday night, Stockers was only being powered by two Lucozades and a packet of ham. Fortunately, complimentary corn kernels were on hand to provide him with further sustenance. Seemingly revived, Stockers convinced us we needed a carry out for the six minute train journey to Herne Hill. Whilst a little excessive, it did provide a great opportunity for a lean on some bins before heading to Canopy. As many residents of South East London will know, Canopy are purveyors of some fantastic beer—the Sunray Pale Ale we enjoyed on cask at the Dodo in Hanwell lives long in the memory—and their taproom is a real treat, hidden as it is at the end of a railway arch industrial estate. They had been burgled recently so it was great to see the place packed, punters out in force as we savoured some more Sunray Pale. Next we made our way up the road to Bullfinch who probably have my favourite taproom in town, beautifully kitted out so it feels more like a pub than a working brewery. With the news that Stockers had to join another pub crawl, there was just enough time for the obligatory Christmas jumper shot. When he'd left we made friends instead with the numerous dogs frequenting the place, Sydney in particular was an absolute smasher. The day wound down from here, although Bez and I nipped in for a nostalgic half of Bengal Lancer in the Half Moon ("be ridiculous not to in this weather") before heading off to join the Parkrun Christmas social in The Phoenix at Denmark Hill. It's fair to say the day had delivered on the three objectives and had got us fired up again ahead of (again we hope) getting up and running later this year. We can't wait to provide a welcoming home for South East London beer.